I hope that the day where I no longer sit in awe of Georgina Chapman and Keren Craig’s work never comes. 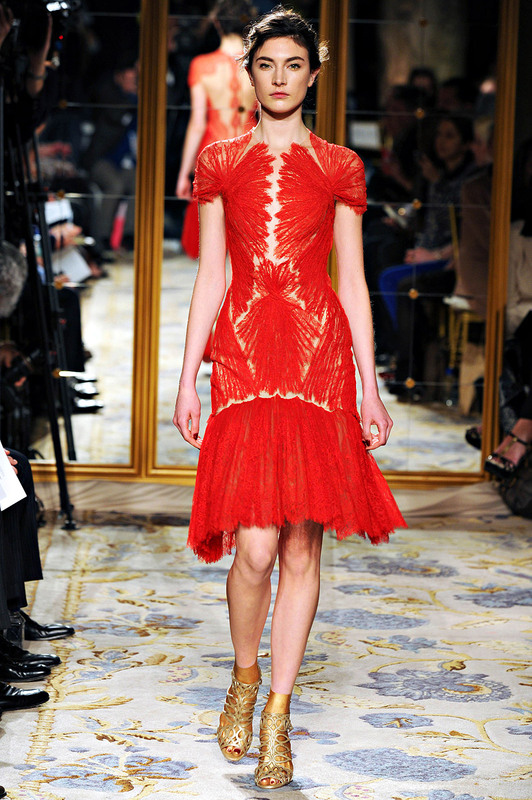 Ever since its inception, Marchesa has been astonishing its audience with their beautifully-wrought creations. The intricate and ethereal pieces are so gorgeously crafted that they hardly seem real. Brocade, lace, and tulle are transformed into something else entirely as Chapman and Craig re-imagine William- Adolphe Bouguereau’s A Soul Brought to Heaven into breathtaking reality. The models appear to be floating on a cloud of tulle and goose down feathers as they glide down the runway. The amount of detail and necessary work accompanying it blows my mind sometimes. I am riveted by the construction of every piece; of how shredded tulle and elaborate lace patterns can come together to become something rather unearthly. The craftsmanship is exquisite. 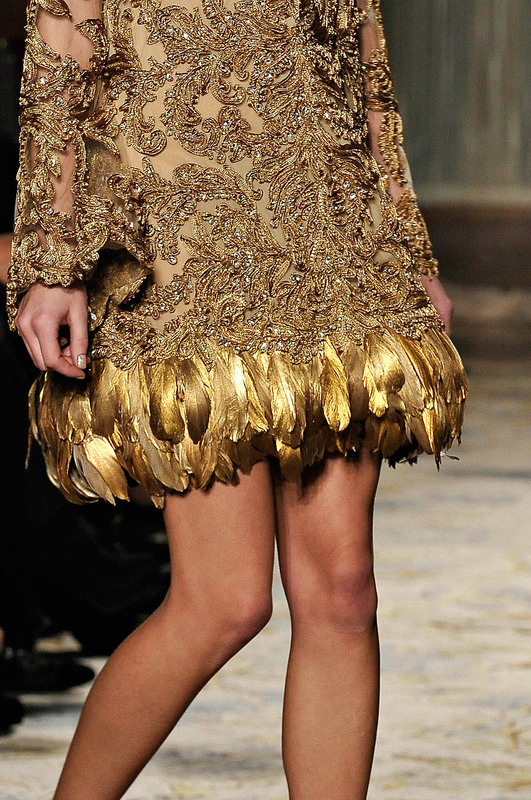 And sweeping skirts and bejeweled embroidery certainly make for a high impact entrance, full of drama and opulence. One would think that we would tire of Chapman and Craig’s intricately romantic vision by now, but how can anyone be tired of this? They spin fairy-tale femininity into a thing of beauty. The true standouts, however, are the looks that developed from a more macabre influence–the human skeleton. I love how Chapman and Craig have incorporated a delicate skeletal structure into the gowns. The gilted vertebrae peeking out amidst the lace perfectly suits their aesthetic while the blood red tulle mimic muscle tissue in a darkly stunning way, putting a twist on an otherwise angelic collection. Chapman and Craig’s celestial flight-of-fancy manifests in a spectacularly divine collection that shines far beyond fairy-tale daydreams. It is always intriguing to see how a rather random inspiration (at least to me) manifests itself in the Mulleavy sisters’ latest collection. Fall 2012 began as an exploration on the history of the building of Australia (from the Victorian era to the late thirties) and resulted in a thoughtful forties redux. 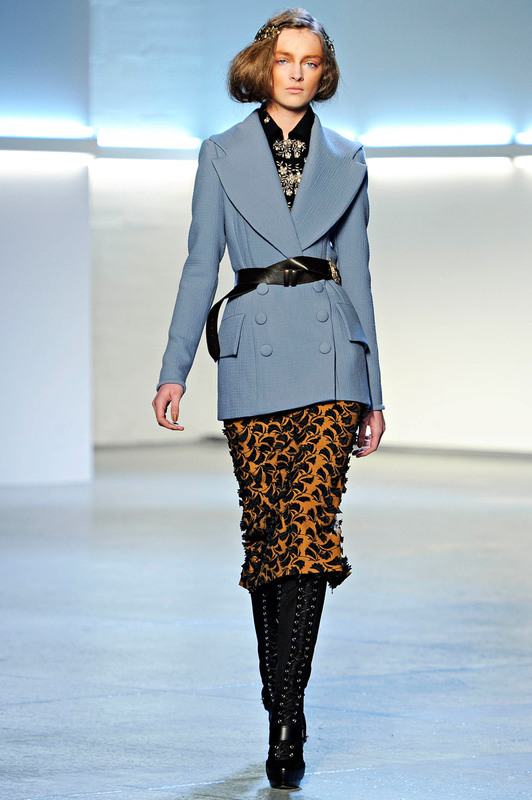 While this collection is probably their most ready-to-wear as of late, Laura and Kate Mulleavy lose none of Rodarte’s trademark romanticisim. They have just translated their poetic vision into real life, adding a dose of utilitarian practicality to the artistic dreaminess which could very well push their brand on a whole different level. Every season, I always characterize a fair amount of the collections as “romantic” or “ethereal,” but there is something about Rodarte that takes it beyond mere flight of fancy. There is a thoughtfulness and intelligence to the Mulleavy sisters’ work that clearly comes across. 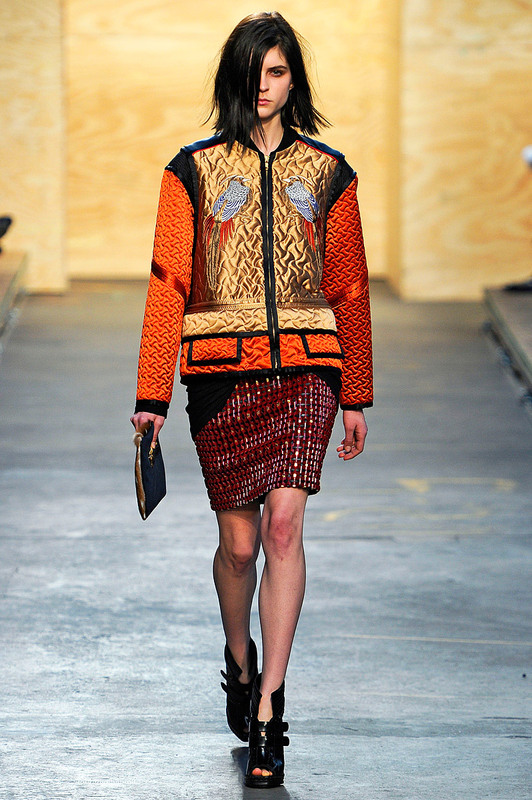 I would never apply “whimsical” to a Rodarte collection; nothing about what they do feels trivial. And I really like that, that their thought process is so readily apparent in their pieces. 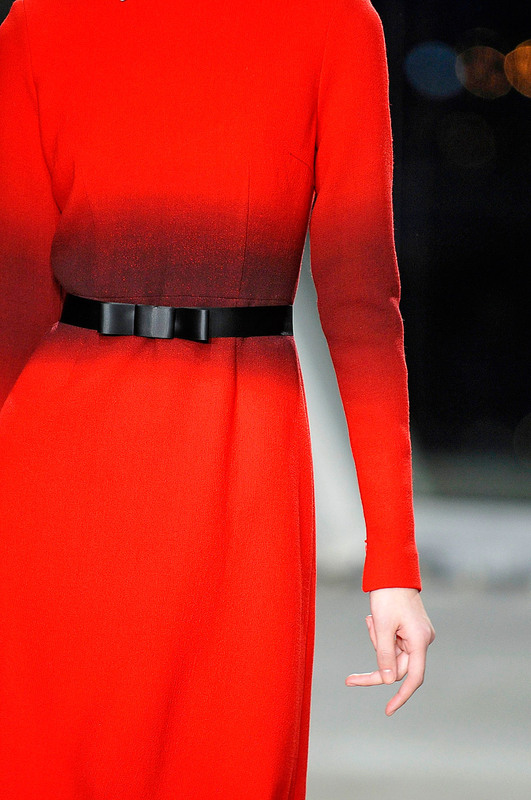 I love that there is always an avant garde quality about the collection–regardless of commercial appeal. Oh, and the late thirties/forties silhouette is lovely as well. 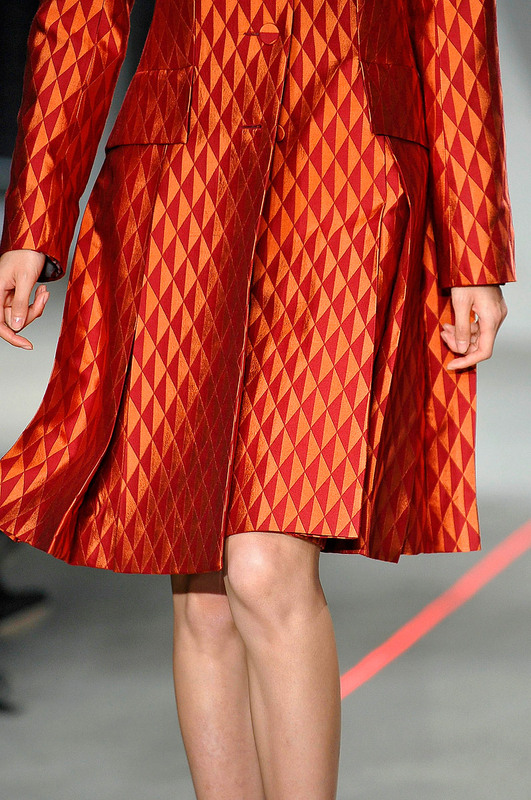 The tailoring is built layer by layer with the texture offsetting the clean lines. 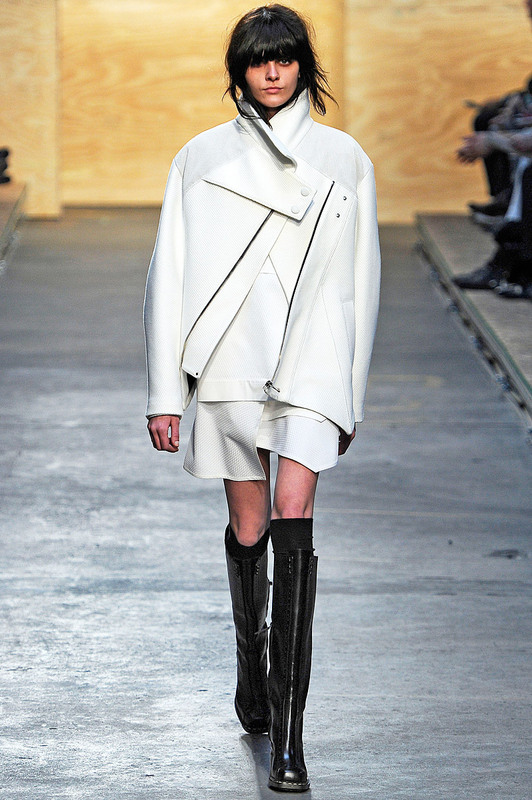 I like how all the elements come together for a rather unique take on structured outerwear, resulting in beautifully constructed looks. The texture and print are brilliantly thought out with pointed paint splatters and shadowy finger painting alluding to aboriginal art. I love how they appear like broad strokes of a painting as the effect creates a look that is a bit blurred at the edges. 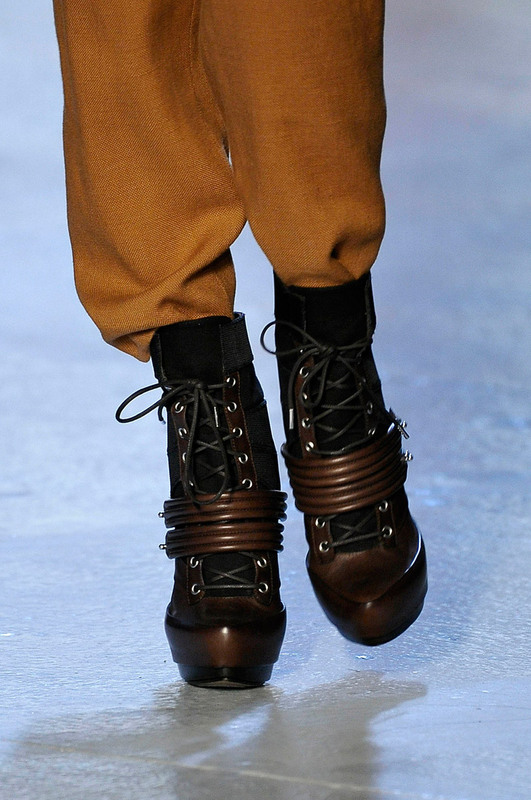 Plus, these poetic pieces are anchored by delightfully rounded clogs and boots. The shape is interestingly modern, and the heaviness to them is fantastic. I like how they can come across as both utilitarian and mod. I shouldn’t really be surprised as combining seemingly incongruous genres has always been a specialty of the Mulleavy sisters.